Did Napoleon win in the end? Andrew Roberts's parallel biography of Napoleon and Wellington, concentrating on the Battle of Waterloo (though the actual battle occupies but a chapter) deals with a number of fascinating subjects, including the posthumous reputations of the two men, both the various cults that have grown up around each and the far more interesting historical analyses. There is no question that both were interested in how history would judge them. 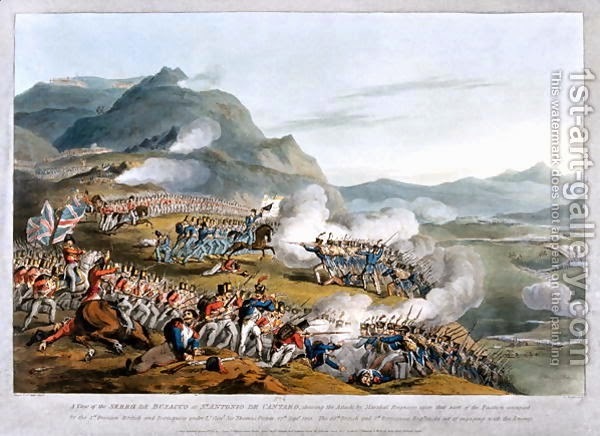 Napoleon seems to have spent his exile on St Helena not just in re-fighting Waterloo but in lining up ever changing culprits for his defeat. Oddly enough it was never the Duke, who, in Napoleon's view ought not to have done any of the things he had done or made any of the decisions he had made because they were clearly wrong. A clear example of the supposed French attitude of "yes, it may work in practice but does it work in theory?". Wellington responded by analyzing at great length though only in private (in public he remained indifferent to the various barbs from Napoleon's worshippers and praised the man as a great general as well as an admirable reformer) the Russian campaign in which he pointed out every mistake Napoleon made as he had perceived them. The memorandum was published posthumously and may be said, according to Mr Roberts, to be Wellington's response to Napoleon's criticisms of Waterloo. There is an obvious difference between the two: Wellington was analyzing Napoleon's mistakes in a campaign that was a catastrophic defeat, Napoleon was analyzing mistakes made by the unquestioned victory of Waterloo. There is some indication that Wellington may have inspired and even contributed to an important article in 1843 in "the foremost Tory intellectual publication of the day", the Quarterly Review, by Sir Francis Head, a regular contributor to the publication who had been at Charleroi and Waterloo, that destroyed several recent publications, including one by Clausewitz that "proved" that both Wellington and Blucher had been "surprised, outmanoeuvred, and out-generalled" by Napoleon. In exile Napoleon was convinced that the Bourbons would have to recognize him and allot him necessary honour. It was the Orleanists who brought his body back to Paris and had it buried with great pomp and circumstance and very shortly after his conqueror's death, the nephew, Louis-Napoleon, proclaimed himself Emperor and apparently restored the legitimacy of the Bonapartist rule. Then again, it is better to draw a veil over the Second Empire and its less than glorious final demise. In one of his administrative rather than military phases, the first consul predicted that the Code Napoléon would be remembered long after his victories were forgotten. In the Prussian Rhenish provinces the Code lasted until 1900, and it still forms the basis of much of European jurisprudence today, a legal system that has already established its legislative primacy over British domestic law-making. As the authors of the 1993 edition of the legal textbook French Administrative Law point out: 'Napoleon may perhaps be thought of as the principal .... inspiration of the European Court [of Justice], which is itself buttressed by the principles of administrative law that his own institution, the Conseil d'Etat, has evolved during the last 190 years. Napoleon's programme, of a politically united Europe controlled by a centralised (French-led) bureaucracy, of careers open to talent and of a written body of laws, has defeated Wellington's assumptions of British sovereign independence, class distinctions and the supremacy of English common law based upon established, sometimes ancient, precedent. 'I wished to found a European system, a European code of laws, a European judiciary,' wrote Napoleon on St Helena. 'There would be but one people in Europe.' There is some irony in the fact that Waterloo was fought a mere twelve miles from Brussels, the capital of today's European Union. 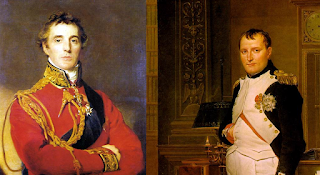 For, although Wellington won the battle, it is Napoleon's dream that is coming true. Certainly the thinking behind the organization that has evolved into the European Union was just that: an imposition of a Napoleonic, French-led system on as much of Europe as can be managed. But things have not really turned out that way and the system is showing some signs of fraying, interestingly enough for the same reasons as the Napoleonic empire could not really have survived. In its own way the EU is also in need of further "conquests" though these are not achieved through warfare but economic and political force majeure and, more importantly for the future, there are strong signs of nationalist opposition to any further advances of the system. The dream of "but one people in Europe" remains just that - a dream. First, I have to report that yesterday I went to the National Film Theatre to see a rarely (well, hardly ever) shown British film The Reluctant Widow, based on one of Georgette Heyer's Regency novels. Both Wikipedia and IMDB give a bizarre misinterpretation of what happens in the film, even calling the heroine Helena when she is Elinor. It is a little perplexing why anyone should put up a plot summary of a film they had not seen or know anything about. The summary of the book's plot shows that the film kept close to it with a few changes, some of which work and some of which are superflous. Georgette Heyer disliked all that she heard about the film or saw when it was being made and she refused to see the finished product or sell the film rights ever again. That is a great pity as her books really cry out for dramatization. The film had all the Heyer atmosphere and characteristics as well as being highly entertaining (as are the novels). In addition, and Miss Heyer would have appreciated this, it is meticulously researched as far as design, clothes, uniforms, architecture and views of London is concerned. The Art Director responsible for that was Carmen Dillon, a woman of great stature who made her name in what was then a man's world, was the Art Director on some of the best known British films like The Importance of Being Earnest (for which she won the Best Production Design Award in Venice) and Richard III as well as winning the Oscar for the Art Direction of Hamlet, the first woman ever to do so. Fortunately, there are many events and exhibitions that have to do with the anniversary and an excellent one is a free exhibition at the National Portrait Gallery, entitled Wellington: Triumphs, Politics and Passions. As one would expect, much of the exhibition revolves round various portraits from very early ones to the famous 1844 daguerreotype. One of the big draws is the panoramic view of Wellington's state funeral in 1853 by Henry Alken and George Augustus Sala, which will be displayed in full for one hour on Thursday, June 18. At present one can see sections of it in the display case and in full on the screen above. The funeral was watched by an estimated million and a half people and, as the notes say, reminded people of Wellington's days of glory, the somewhat more ambiguous record as a Prime Minister having been forgotten. One can draw certain parallels with the Churchill funeral of just over fifty years ago, as this blog wrote about it on the day of the anniversary. There is one important difference between the two farewells, both to great men, both symbols of their age: Wellington's victory in 1815 ushered in an age of British supremacy in the world in matters political, economic and ideological; Churchill's victory in 1945 saw the end of that age. Farewell to him was also a farewell to that. Of particular interest were portraits and paintings by soldiers and young officers who were with Wellington in the Peninsula. Edmund Wheatley, a junior officer in the King's German Legion kept a diary and sketchbook for his fiancée, later wife, that has since been published. 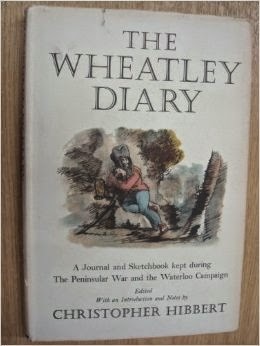 Wheatley was at Waterloo as well and left his account of that, too, as well as some pictures. Thomas Staunton St Clair, an officer in the 94th Regiment of Foot, sold his sketches to a consortium of London publishers. Other officers invited artists to paint battle scenes or portraits. The most interesting couple of exhibits in the section on Waterloo are the two prize winners in a competition announced in 1815 by the British Institution on the theme of "successes of the British army". 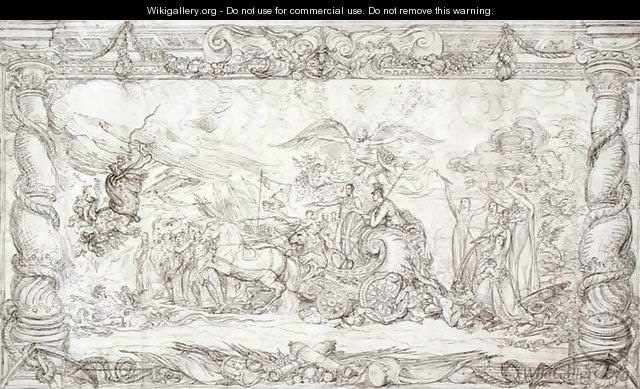 The winning entry was a truly hideous work by James Ward, entitled Waterloo Allegory for which I can only find the design as an illustration. Possibly, the sheer hideousness of the work made the British Institution re-think matters and, unexpectedly, they announced a second prize, which went to George Jones, a former soldier though also a professional artist, who produced an interesting and fairly realistic painting that centred on the Duke of Wellington. George Jones, it seems, was so taken by the theme that he kept painting it over and over, earning the nickname "Waterloo Jones". To be fair, he also painted other wars and campaigns. 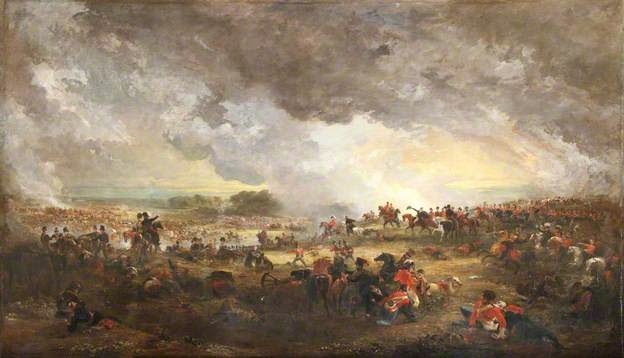 It is Waterloo year, the first that can be fully celebrated since the year itself as 1915 was hardly a time for celebrations. Tory Historian has been doing various things: going to the National Portrait Gallery exhibition about the great Duke, watching a poor play performed with great zest in a Regency toy theatre in the British Museum where there is an exhibition about propaganda for and against Bonaparte and, as of yesterday, re-reading Andrew Roberts's wonderfully well written Napoleon and Wellington. The exaggerated loathing of the Whigs for the man who threatened and finally defeated their idol Napoleon was to be a constant feature throughout Wellington's career. They emerge from their story not as witty, brilliant, big-hearted Olympians of politico-social mythology, but as quotidian, nit-picking, mean-minded quasi-traitors. Tory Historian has had a number of heated discussions with people who appear to believe seriously that the Whigs were somehow more democratic and more concerned with the fate of the common people than the Tories. They were mostly concerned with power that they wanted to and often did see in their own hands. Their attitude to the French Revolution once the heady early days gave way to state terror and oppression is extraordinary by any standard and their attitude to France once it became Britain's clear enemy verges on bizarre or, as Mr Roberts, treacherous. There was much more to the suffragist movement than the WSPU, which was small, less and less influential in the years before the First World War and, many said even at the time, counter-productive in its actions and attitudes. The important role traditionally claimed by the Pankhursts has not, so far, recovered from the careful analysis of their organization by Andrew Rosen. Their suffering and sacrifice made an indelible impression that can never be forgotten; but history is an unsentimental business, and it has clearly exploded many of the more extravagant claims made by the suffragettes. Pankhurst claims that they had won public opinion to their side scarcely seem consistent with the antagonism towards them amongst working-class women which Jill Liddington has discussed in her valuable study of Lancashire. Nor does it square with the growing hostility of the crowds and the defeat of the Pankhurst-backed candidate at the Bow and Bromley election in 1912. Always a small organization, the WSPU split repeatedly until it became a mere rump of personal followers of the Pankhurst family. Nor, ultimately, did militant tactics succeed in shaking the resolve of the government on women's suffrage; rather they alienated, if only temporarily, much of the support built up amongst politicians for enfranchising women. Martin Pugh has been accused before of an anti-Pankhurst bias and even inaccuracy but there is a good deal of evidence for what he says here. Lady Knightley, a prominent member of the Primrose League and a Conservative suffragist, certainly thought their methods are counter-productive though she admired Mrs Pankhurst personally. History may be unsentimental but media, the art world and popular mythology all have a great dash of sentiment in their activity and the glorious Pankhursts together with their followers seem to figure prominently in all of them. In the same way, it is a mistake to suppose that women, whether active or not, were all pacifists during and immediately after the First World War, no matter what we might glean from books by and about Vera Brittain. The National Portrait Gallery has a small but fascinating exhibition of women during the Great War, with nary a mention of either Miss Brittain or her friend Winifred Holtby. There are photographs and life stories of some of the many other women who became nurses, organizers and many other things during that conflict. The stories are fascinating and the conclusion is very sad: though women won many rights while their work was desperately needed, much of that was lost in the immediate period after the war. Nevertheless, in 1918 a good many men and some women were enfranchised for the first time and there was, naturally enough, a good deal of worry and discussion how these groups would vote. The results were interesting in 1918 and subsequent elections. It seems that very few of the anti-suffrage MPs suffered because of their stance, most of those who stood being re-elected. Here are some interesting points Martin Pugh makes about the 1918 election, which was somewhat unusual politically but interesting in what it showed in voting patterns. The inclusion of the wives of workingmen - the bulk of the 8.4 million women - largely satisfied the non-Conservative politicians that there would be no additional advantage for the propertied classes. But the new electorate of women displayed an obvious bias towards age. Only the youngest of the women had been born in the late 1880s and thus reached an impressionable political age in the Edwardian period when Liberal-Labour reformism was at its height. The great majority of women voters are likely to have formed political loyalties in a period when the choice was between Conservative and Liberal, though we must allow for the realignment of some of the most politically active women as a result of the suffrage controversies prior to the war. Although most women electors had not voted even in a local government election before, the low turnout of 58.9 per cent in 1918 should almost certainly not be attributed to female abstention since the 12.9 million males included 3.9 million naval and military voters of whom it was reported that two thirds failed to take the chance of voting by post or by proxy. Modern studies confirm that young voters are consistently the least likely to participate, and it thus seems very likely that abstention in 1918 was due to male behaviour rather than to the more mature female electorate. This is corroborated by many contemporary accounts which refer to the women as undemonstrative but determined in turning out to vote. He then turns to some of the details of the voting patterns. Dr John Turner has approached the 1918 election by using the evidence provided by the electoral register of 1915 and the number of men included in the 1918 register to estimate the total number of new male electors. He then examined the performance of the Labour Party's candidates and found that there was an inverse relationship between the size of the Labour poll and the proportion of new voters. In fact the greater the proportion of new male voters the less well Labour did and the greater proportion of women voters the less well Labour did. Yet a statistical relationship is one thing: explaining it is another. This can be done at two levels. From a long-term perspective the emergence of an organised Labour Party can be seen to have been linked to the relatively prosperous, unionised and politically aware working-class communities who were already enfranchised to a great extent. Consequently the incorporation of the whole of the male working class weakened Labour's position in the short run. Similarly, women as a group were as yet relatively uninvolved in the social and institutional networks that fostered support for Labour, and their enfranchisement was unlikely, without further changes, to prove advantageous. More immediately women appear to have reacted to the 1918 campaign in a rather striking way, as contemporaries observed. It is easy to be misled by the prominence of a small group of women activists i n the anti-war cause. To those politicians who had hoped or feared that women would want to vote for international peace and conciliation the Coupon Election came as a shock. Anti-war candidates such as Ramsay MacDonald experienced heavy defeats in their constituencies, in his case at West Leicester where the women voters were reported to be 'bloodthirsty, cursing their hate', and as posing a physical threat to pacifist politicians. I realised at once that my supporters were not the women - this election was their chance of 'doing their bit' and the were all for 'going over the top' to avenge their husbands and their sons. My supporters were the soldiers themselves. Accounts of the newly enfranchised women voters' behaviour at meetings confirm this view and there is a great deal of interesting material available on the differences between the servicemen and those who had stayed at home in their various attitudes towards the peace negotiations. It would have been interesting to know how many of the more bloodthirsty women had 'done their bit' during the war itself. The Guildhall Library is not known well enough. Admittedly, it is housed in a hideous building just round the corner from the Guildhall, in itself a fascinating place, but the collection, which is freely available to anyone who wishes to consult it, is stupendous. There really is no other word for it. Among other collections there is an enormous one on food and drink that includes numerous cookery books of past and present. At the moment there is an exhibition there, that I can strongly recommend, of three Victorian cooks and writers of cookery books, Mrs Beeton, of course, her predecessor, Eliza Acton and the "people's chef" Alexis Soyer. The exhibition is quite small, with three glass topped stands, one for each personality and an amusing display of cardboard models of various deserts from Mrs Beeton's Book of Household Management. The accompanying notes give a good summary of the various cookery books and one or two utensils displayed. The story of Mrs Beeton and her books is well told and may not be of great interest to people who think they know everything about the lady and her work but I would advise paying a little attention as, for one reason or another, she has been traduced in popular opinion. One reason is that her widower (she died at the age of 28) found himself in deep financial problems and had to sell his journal and the rights to her book. This was subsequently republished with ridiculous additions, particularly of the grand Edwardian variety. The original text was not reprinted in facsimile till the 1980s, reprinted several times and has now become available on line. Readers who are interested can look at the book and see that far from flouncy it was a very straightforward manual that gave advice and instructions to middle class wives and mothers on how to produce reasonably nourishing food at reasonable prices (as well as the occasional grand dinner) and how to run their households. 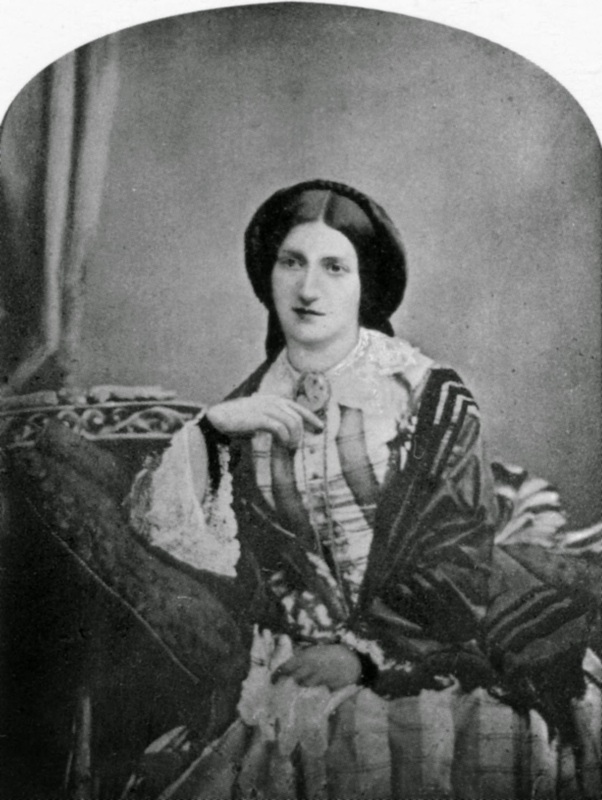 It has been said with some justification that Mrs Beeton, unlike some though not all modern cookery writers did not bother to test all the recipes (there was no time for that, given the speed with which she produced the installments that became the book eventually) and that she plagiarized a great deal, particularly from Eliza Acton. We run into difficulties here. As the exhibition and the notes explain, Eliza Acton, though less well known, is more highly regarded by a number of experts like Elizabeth David and Delia Smith. Her life appears to be somewhat more glamorous than the overworked Mrs Beeton's and recently it has become fashionable to elevate her while denigrating her successor. A few years ago Sheila Hardy produced a biography of Eliza Acton and called it The Real Mrs Beeton. I have not yet read the book but fully intend to and may well find it very interesting but I do think that is a silly title. Eliza Acton was not the real Mrs Beeton unless you use that name to describe any cookery writer; she was the real Eliza Acton and not, by a very long chalk, the first cookery writer for middle class families in England. Miss Acton has long been set up as the saint to Mrs Beeton's sinner. Where Isabella Beeton (pictured) is Victorian in a stodgy, over-boiling the veg, old biddyish kind of way, Eliza Acton is an Austenish heroine: a stylish Regency spinster, a poet rather than a journalist, a committed cookery writer rather than an opportunistic hack. Elizabeth David, herself a patron saint of food writing, enshrined Acton's superiority to Beeton in a couple of important revisionist articles that appeared in the 1960s. Jane Grigson, also generally agreed to be on the side of the cookery angels, further hymned Acton's greatness as the true founder of modern recipe making. So, too, does Delia Smith in her foreword to this new biography. In short, anyone who wants to be in the kitchen cool gang knows that the name to drop is Acton's. There's an added frisson to the Acton/Beeton face-off, which comes from Beeton lifting scores of "receipts" from Acton's Modern Cookery for Private Families, stitching them into her own Book of Household Management as if they had emerged from her own steamy kitchen. Household Management went on to become a cultural behemoth, lumbering through the 19th and 20th centuries gathering millions of readers as it went, while Acton's Modern Cookery remained a minority taste. To like Acton, then, is to assert not just your culinary discrimination but your sense of moral justice too. Without knowing what Miss Acton's poetry was like it is hard to glamorize that aspect of her literary activity but restoring her name in the ranks of top cookery writers is a reasonable enough exercise though I do not think it had ever been really dropped. But does it have to be one or the other? Can one really not read both if interested in nineteenth century cooking and make decisions about quality of recipes on the basis of that? While we are on the subject of Austenish heroines, let it be noted that Miss Austen's heroines did not cook and only secondary characters supervised the kitchen. Mrs Bennett makes it very clear twice that her daughters did not have anything to do with cooking, baking or any kitchen activity.